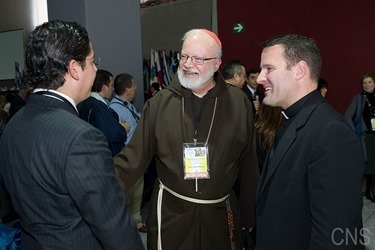 During the course of my time at the US Bishops meeting and the Vatican’s Latin American Conference last week there were several events in the Archdiocese I would like to share with you. 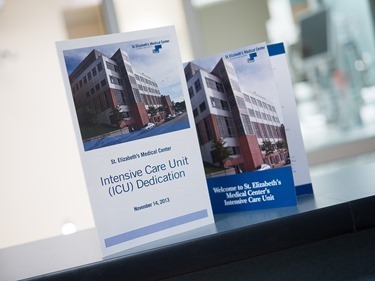 Last Thursday, St. Elizabeth’s Medical Center dedicated a new state of the art Intensive Care Unit. 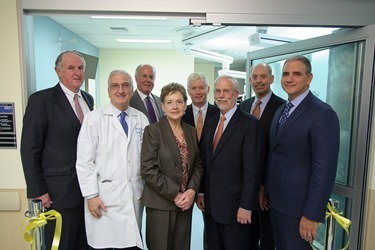 Bishop Hennessey led the prayers at the dedication, noting Catholic hospitals important role in meeting the needs of our local communities. 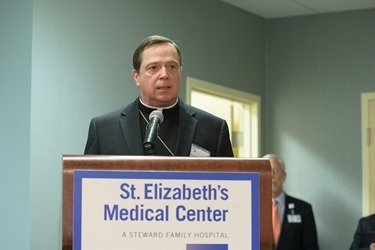 I am grateful to Dr. Ralph de la Torre and his leadership team at Steward Health Care for this advance in Catholic healthcare in the Archdiocese. 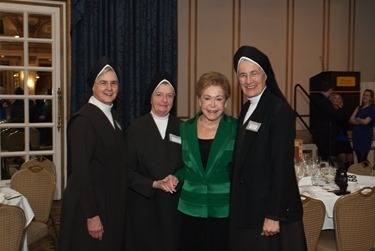 Later that evening the Carmelite Sisters of the Aged and the Infirm celebrated their 60th Anniversary in the Archdiocese of Boston. 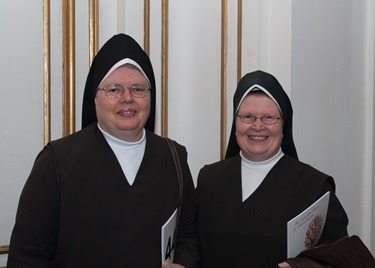 More than 400 of the community’s friends and supporters gathered to thank the Sisters for their service and join in presenting Mother Mark Louis, Superior General, with the Venerable Mary Angeline Award, in honor of the community’s foundress. We are grateful for The Carmelite Sisters’ ministry of witnessing to the caring presence of Jesus Christ with superior care and concern for our seniors at Marian Manor, St. Patrick’s Manor and Carmel Terrace. 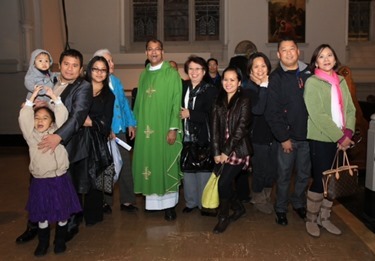 Saturday evening 800 members of the Filipino Catholic community gathered at the Cathedral of the Holy Cross for a Mass following the devastation of Typhoon Haiyan. Father Cyriac, the community’s chaplain, and Ms. Gracita Chiefe, chair of the Filipino Pastoral Council, assured all present of the Church’s support for the relief efforts in the Philippines and local assistance as families learn of loved ones lost in this natural disaster. We continue to pray for all affected by this situation. 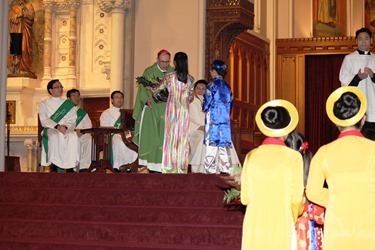 On Sunday, afternoon almost 1,500 members of the Vietnamese Catholic community gathered at the Cathedral for Mass in anticipation of the Feast of the Vietnamese Martyrs, celebrated on November 24. 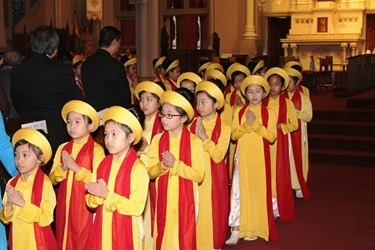 The Archdiocese is blessed by the presence of a thriving Vietnamese community whose faith, devotion and dedication to family enriches our spiritual life. 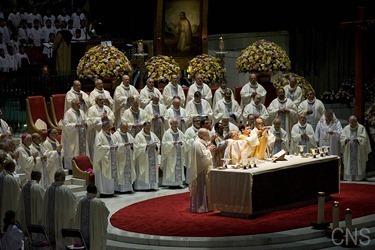 I look forward to joining them for this annual Mass next year. I was also visited by Steve Caron and Damien DeVasto from the Order of Malta. They came to speak to me and update me on some of their projects. 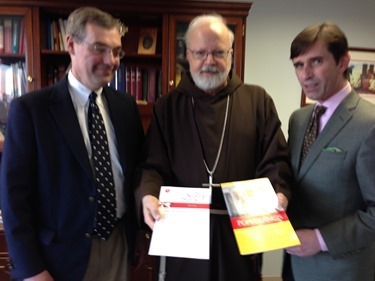 They also presented me with copies of The Serving Brother publication, which the Order produces and distributes to prison inmates throughout the country. The Order’s mission is to care for the needy and dispossessed and this one of the ways in which they carry out their work. 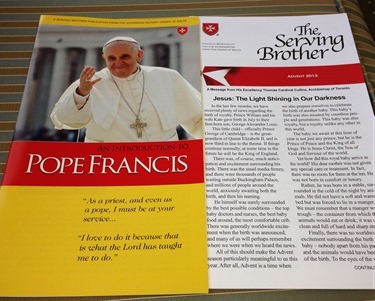 I understand this publication has been very effective in helping inmates live out their faith during their time in prison. 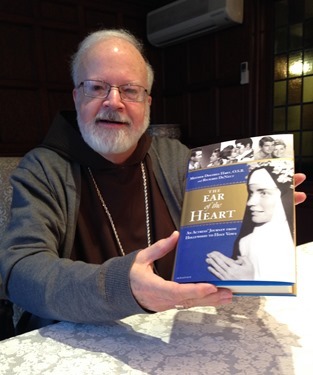 Mother Dolores Hart, O.S.B., prioress of the Abbey of Regina Laudis in Bethlehem, CT came to the Cathedral for a lecture and signing of her new book, The Ear of the Heart. 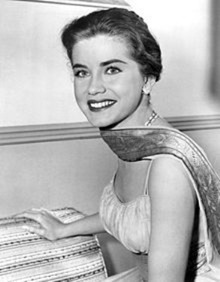 Mother Dolores was a successful actress until she decided to leave Hollywood in 1963 to enter religious life. She was kind enough to give me a copy of her book. Also this week I was very happy to see that the wonderful success of St. Paul’s Choir School in Cambridge has been receiving a lot of attention. As part of the celebration of the 50th anniversary of the school, a couple weeks ago they made a trip to the Vatican where they had the honor of being able to sing for the Holy Father. 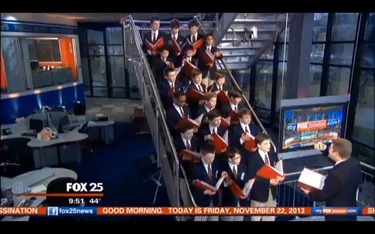 And this morning, they were featured on Fox 25 news here in Boston. We congratulate the faculty, staff and students of the Choir School! 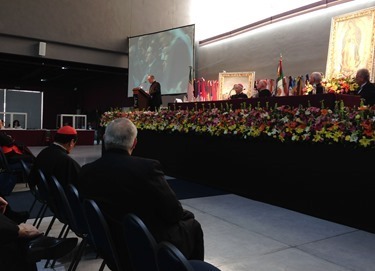 Earlier this week, I joined about 80 of my brother bishops in attending the conference “Our Lady of Guadalupe, Star of the New Evangelization on the American Continent,” in Mexico City on the new evangelization of the Americas. 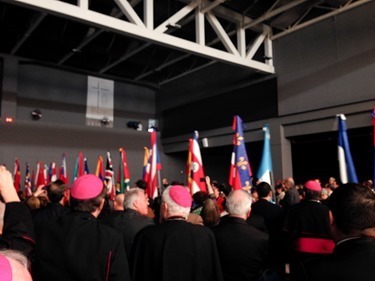 In the year 2000 there had been a synod for the Americas, and out of that came the document called “Ecclesia in America,” in which Pope John Paul II called for greater cooperation and collaboration among the Catholics of this hemisphere. 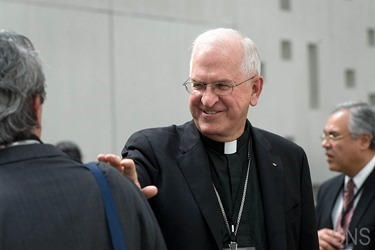 For a long time nothing specific was done to promote that, but Cardinal Ouellette who is now the head of the Pontifical Commission for Latin America called for a meeting last year in Rome, to which I was invited to give a talk. 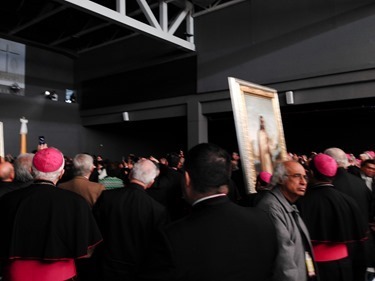 Now this year, in Mexico he brought together bishops from Canada, the United States, Central America, South America and the Caribbean to again address this topic. This was really a wonderful experience, truly a pilgrimage. 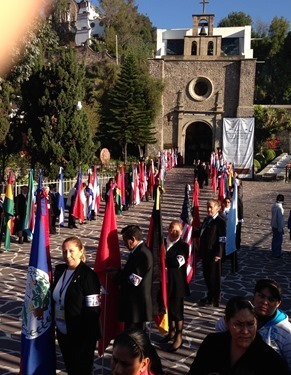 One of organizations sponsoring the gathering was The Knights of Columbus. Supreme Knight Carl Anderson gave a wonderful address on Ecclesia in America in which he pointed out the American continent is really the only Christian continent left in the world. It was certainly a provocative statement, but certainly half of the Catholics in the world are in this hemisphere. Having a Pope who comes out of this American experience is also a very special moment of grace in the Catholic Church. In these pictures you can see the original Basilica where the tilma had been kept for centuries. One of the miracles of the tilma is that this cloth woven from natural fibers would ordinarily have deteriorated in about 20 years, but still 500 years later, it is still as beautiful as ever. 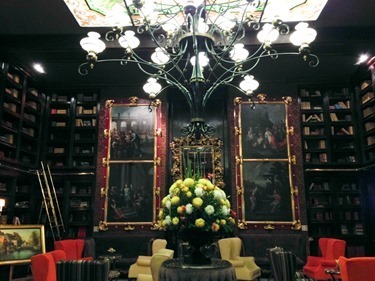 And, of course, for many centuries did not even have a glass cover, it was just displayed exposed to the elements. 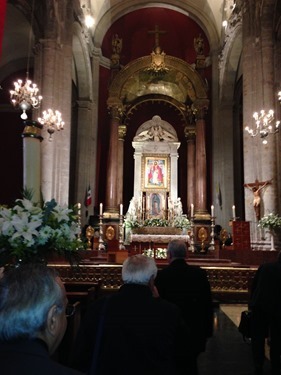 When I first went to Mexico in the 1970s with my whole family, because my sister was living there at the time, I celebrated Mass at the altar in the Basilica. In those days, the tilma was right behind the celebrant. 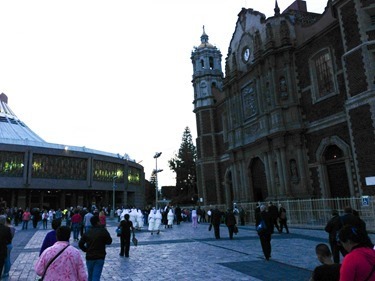 When I went back in 1979 for the Puebla Conference, the new Basilica had already been constructed. 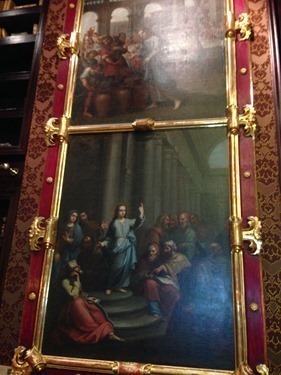 The pictures here show how below the tilma, and out of sight from those in the church, there are conveyor belts that bring people past the tilma, so they can see it. 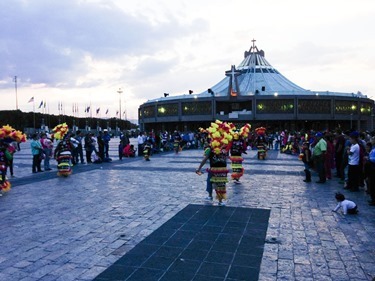 It is quite an ingenious system because it allows the church to be used without the distraction of the countless pilgrims who pass in front of the tilma each day. 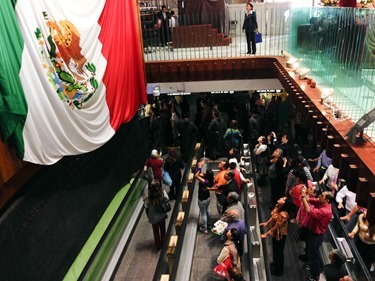 The shrine is the most visited place of pilgrimage in the world, receiving over 10 million pilgrims every year. 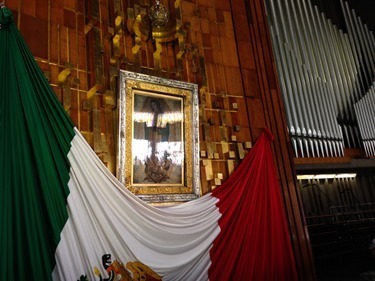 These pictures show the entrance of the images of Our Lady of Guadalupe and Saint Juan Diego. 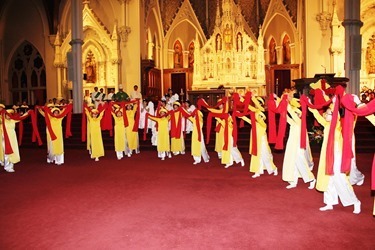 They were brought into procession from the church to the conference hall, where we had the lectures and discussions. The conference was a very prayerful experience with many rosaries, Masses, processions and opportunities for us to pray at the Basilica. 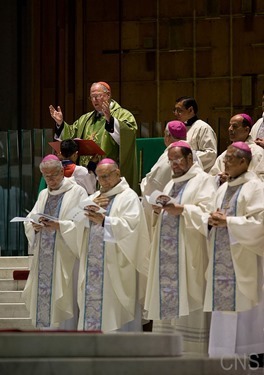 Cardinal Norberto Rivera, the Archbishop of Mexico City is always a very gracious host. Cardinal Dolan celebrated one of the Masses for us. Among the many speakers were and Archbishop Kurtz and the president of the Canadian bishops conference, Archbishop Durocher, delivered addresses. We also heard from my classmate, Archbishop Charles Chaput, who gave a beautiful address. I was part of a panel with Cardinal Maradiaga of Tegucigalpa and Cardinal Robles of Guadalajara. The three of us talked about culture, society and the new evangelization. In my reflections, I spoke of the differences between the cultural Catholicism we had in the past and the need for a new evangelization in a world where people’s participation in the Church is less driven by their membership in a particular ethnic group or culture, but now must be a more personal, intentional decision. I said that will require another type of evangelization, and much of it has to be done one-on-one. This certainly underscores the need to prepare the laity for this role, because the clergy and religious would never have the numbers that would be required to be able to reach the people in that way. So, there really is a great need for a new apologetic, responding to the questions that people in today’s world have. I also spoke about marriage, particularly the way in which cohabitation is beginning to become so generally accepted as a so-called preparation for — or even a substitute for — marriage and the negative impact that has on family life. I also talked about the importance of immigration, about the way the church has to be attentive to the immigrant population and prepare for a future in which the majority of Catholics in United States will be Hispanic. I talked about the fact that the protection of children must be a priority for the Church, and that I hoped the policies that the U.S. Bishops Conference have developed will be useful to the other conferences as they continue to move forward on this issue. During the conference, I was very happy to have an opportunity to see my sister Mary Ellen, who now lives in Mexico. She came to Mexico City to spend the weekend so I would be able able to visit with her and my brother-in-law, Craig. She was staying in a hotel that had many memories for us, because that is where we would stay when we went with the whole family back in the 70s. 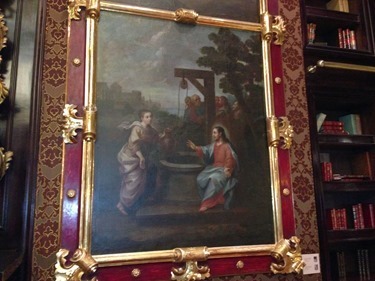 These images of the Samaritan woman, the Child in the Temple are in the lobby of the hotel. 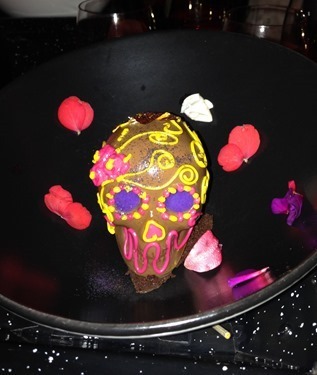 During my visit with my sister, they took me to a very nice Mexican restaurant where they serve chocolate skulls for dessert in honor of the Day of the Dead. 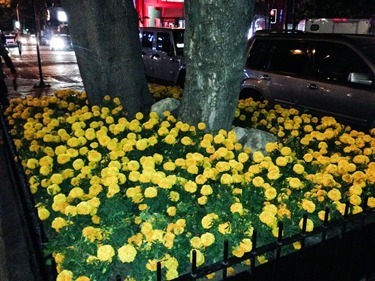 I also took this picture of the marigolds, which are planted everywhere during the November for the day of the dead. Walking near the hotel, I was struck by this display of popular religiosity. 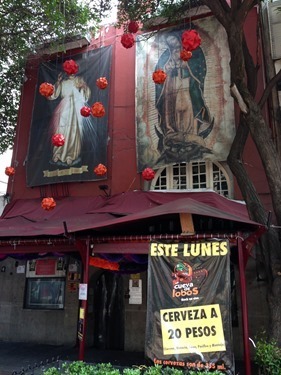 Over this bar they have these huge images of Our Lady of Guadalupe and Divine Mercy and right underneath is a sign announcing that on Monday beer will be on special for 20 pesos! 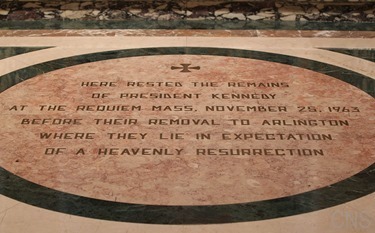 Finally, today, the feast of Saint Cecilia, we mark the 50th anniversary of the assassination of President Kennedy in Dallas. It was a time of great sorrow for the whole world. It was the time of the Cold War and his assassination not only instilled a sense of great sorrow and dismay, but also fear, because there was a feeling that our country’s enemies had done this. 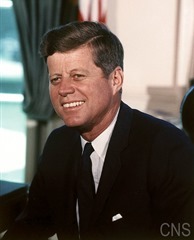 The president’s assassination was followed by the assassination of Robert Kennedy and Reverend Martin Luther King Jr. It was a period of great social upheaval, uncertainty and fear that traumatized the entire population. Among older Americans, who remember that time so vividly, it is often said that people never forget where they were when they heard the news. I was a seminarian at St. Fidelis of Sigmaringen Seminary when the news came. In those days we were not allowed to have television sets in our monasteries, but I still recall that for the president’s funeral they brought in a television set and we watched Cardinal Cushing celebrate the Mass. 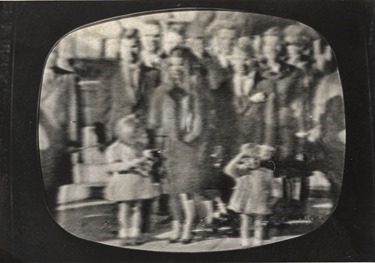 Of course, once the Mass was finished, the television disappeared as quickly as it came. 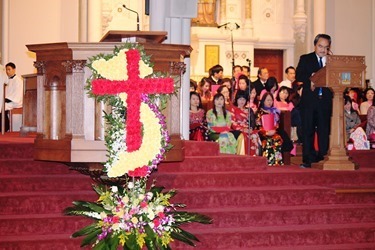 The Funeral Mass, of course, was at St. Matthew’s Cathedral, where I celebrated my first public Mass as well as countless other Masses, weddings and baptisms during the years I served there. 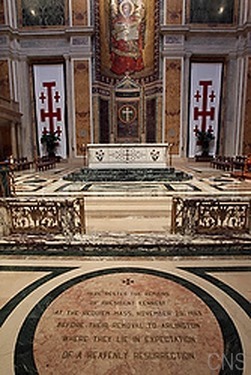 On the floor of the Cathedral, in front of the altar, there is an inscription marking the spot where the president’s body was laid and it served as a constant reminder of that day. Certainly, growing up a Catholic in a time that we never thought there would be a Catholic president, we all rejoiced at his election and everyone was deeply moved by his death. Particularly because he was such a young man with a young family, it was made all the more poignant. It is with sadness that we look back at President Kennedy’s assassination, because we all wonder what America would have been like had he not been killed.